Platelet-Rich Plasma can be successfully used in the treatment of female and male hair loss (androgenic alopecia) through special techniques in non-surgical PRP Hair Restoration / PRP Hair Regeneration. Using nonsurgical techniques that are performed in our office, Dr. Michael Thornton uses high concentrated PRP as a useful option to potentially reverse the effects of hair loss in both men and women by stimulating inactive hair follicles back into the active growth phase. Dr. Michael L. Thornton, a double-board certified Cosmetic Surgeon, exclusively use the Eclipse PRP ® proprietary system to prepare and separate your blood into optimized and high-concentrated platelet-rich plasma (PRP) using a unique blood and plasma separation gel and process to provide PRP Hair Restoration for men and women in Mansfield, Arlington, Dallas, Fort Worth, and the surrounding DFW Metroplex. PRP Hair Restoration and PRP Hair Regeneration is a relatively new procedure that is all-natural and non-invasive and has been found to reduce the effects of hair thinning and found to directly stimulate and grow thicker hair by reverting the dormant hair follicles into a actively growing hair. During your consultation with Dr. Michael Thornton, he will decide if you are an acceptable candidate for PRP Hair Restoration. PRP Hair Restoration does not work for all types of hair loss and it is important that interested clients are properly evaluated by either a dermatologist or hair loss expert to accurately assess if they are acceptable candidates for PRP hair restoration. For example, patients with a diagnosis of scarring alopecia are not candidates for PRP Hair Restoration or other non-surgical techniques in hair restoration, as scars have permanently damaged the hair follicles due to local scalp trauma, incisions, or burns. However, once you are determined you are an acceptable candidate to proceed and based upon our current protocol, you will undergo 3 to 4 monthly treatments of direct PRP scalp injection sessions for optimal results. This “boost” treatment will quickly saturate the hair follicles with high concentrated PRP that is required to stimulate the scalp microvascular system and hair follicles into an active growth phase. PRP Hair Restoration is NOT just for men….we treat women too! Following the initial PRP treatment, you will be reassessed to determine if you were a clinical success, as not all patients respond adequately or successfully. It is advised that you maintain PRP every 4-6 months to maintain healthy and actively growing hair follicles. 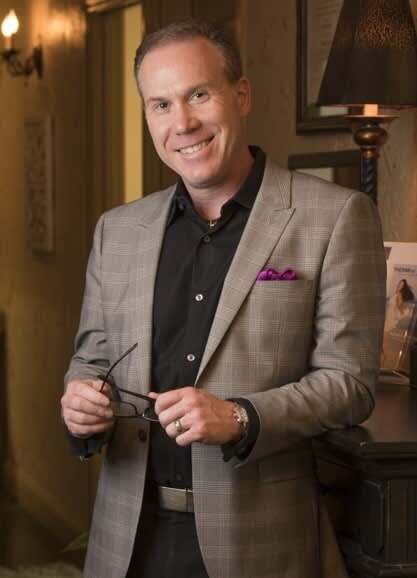 Dr. Michael L. Thornton carefully follows treatment protocols developed by Dr. Jeffrey Rapaport, a pioneer in PRP Hair Restoration. Please visit this website for additional information. 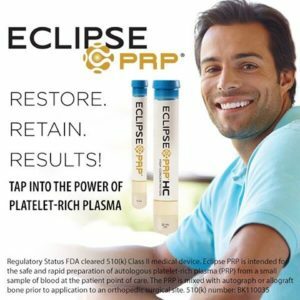 The Eclipse PRP HC System allows for the preparation of high-concentration, pure Platelet-Rich Plasma (PRP) with optimal platelet concentrations and cellular content in a completely closed and sterile system. As seen below, platelet-derived growth factors including epidermal growth factors, vascular endothelial growth factors, fibroblast growth factors, platelet-derived growth factors, collagen stimulating factors, and a myriad of various collagen forming stimulators can be harvested, prepared, and directly applied to the scalp and target the hair follicle. How do you harvest PRP for Hair Restoration? Step 1: Utilizing a specialized blood collection tube from the HC Eclipse PRP® kit, a practitioner draws blood similar to what is required for a basic lab test from your arm. Step 2: The tube is then placed into a centrifuge which spins the blood at a very high speed for 10 minutes, causing the platelets to separate from the other components of the blood. Step 3: Once the platelets are concentrated into the plasma they can be applied to the scalp. Who is the ideal patient for PRP Hair Restoration? The ideal patient is either a male or female with androgenic alopecia with areas of thinning. Predominately bald men are not ideal candidates. Other indications for ideal patient for PRP Hair Restoration include female alopecia areata and female traction alopecia (from braids or local hair damage). Who is not an acceptable candidate for PRP Hair Restoration? Clients who are not candidates to undergo PRP Hair Restoration include minor and major scalp disorders including telogen effluvium, scalp scarring, lupus, scalp infection, or scalp injury or trauma. Others include but are not limited to: pregnancy or breast feeding, cancer or chemotherapy, anemia or low platelets, coagulation disorders, scalp psoriasis. How long does the PRP Hair Restoration procedure take? The blood draw takes only a couple of minutes, followed immediately by a 10-minute centrifugation or preparation of the PRP. Scalp injections take 15 – 20 minutes to complete. How many PRP Hair Restoration sessions are required? Based upon current established treatment protocols, you will require 4 monthly treatment sessions. During each session, Dr. Thornton will place approximately 15-20 subdermal injections of PRP directly into your scalp in the areas of hair thinning. The total treatment time takes about 30 minutes. All treatments sessions are performed personally by Dr. Thornton to provide the highest level of physician-patient engagement. Can a PRP Hair Restoration procedure be painful? We use a Zimmer Chiller to locally cool the scalp during the injection process. Eclipse PRP® uses a special proprietary collection tube that is very close to physiologic pH, which means the PRP is less likely to cause a stinging or burning sensation when applied to the scalp or skin. Is PRP Hair Restoration safe? Since the autologous Platelet-Rich Plasma (PRP) is produced from your own blood, there is virtually no risk of an allergic reaction or rejection. After the procedure your scalp will remain lumpy and bumpy for a few hours and will go away. You may resume normal activities in 24 hours. Complications are minimal. What is the cost of the PRP Hair Restoration procedure? Each PRP Hair Restoration session cost $700 and all sessions are personally performed by Dr. Michael Thornton.